The one thing that comes to mind in the wake of President Obama speaking at Notre Dame's commencement at receiving an honorary degree is this: If Catholics will not defend the central tenets of their faith, they cannot ask us to do so on their behalf. Either they believe abortion is wrong and are serious about it or they are not. So says the fallen Catholic. Hot Air has more on this and the disappointing follow up by the Vatican. This student protesters at Notre Dame showed more courage than the Pope. So much for conviction. I remember that morning well. Listening to Don Imus on the radio. He and Charles mentioning that a plane had hit the World Trade Center. The initial reports said it was a small plane, likely an accident. They mentioned that MSNBC was showing live footage. I raced to the television and turned it on. 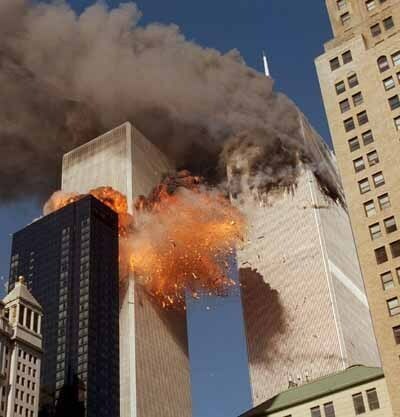 I only had a few moments to take in the spectacle before a black flash, clearly an airplane, came in from the top right of the screen and slammed into the South Tower. My first full thought was that this is no accident. So began that nightmare of a day. Have you forgotten? The anger? The pain? Perhaps we all need to remember how 9/11 felt. Perhaps we need to reopen the wound and remind ourselves of what it is we are fighting for and who we are fighting. It is time to rejoin the fight in full. Time for all of us to begin pulling the oars once again. We are at war. Let us not forget it. Be sure to head to Michelle Malkin and The Jawa Report for more rememberences of a day that will live in infamy.